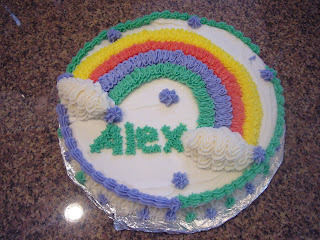 Cooking With The Kids: Wilton 1 - First decorated cake! 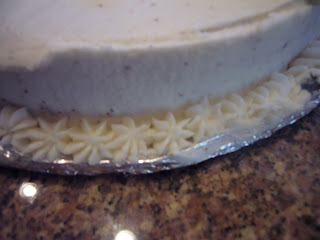 Today Sabrina and I had our second Wilton 1 class - and we got to decorate our cakes! How do you think she did? 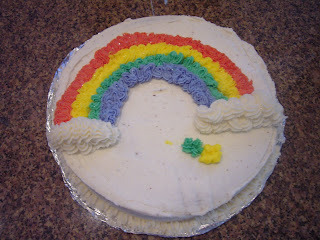 She tried to make pot of gold at the end of the rainbow, but the icing bag tore and made a mess. She was getting frustrated because the instructor made it look so easy, but I kept telling her it takes practice! Just look at those stars! This is my cake - I was trying a bunch of different tips and borders, so it isn't picture perfect, but we had a great time and that's all that matters. Next week, we are doing figure piping!